Maze 19 is a new interactive maze game. 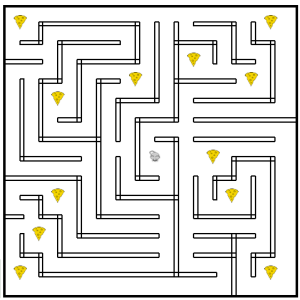 In this game help the mouse gather as many pieces of cheese possible before the time expires. Time is kept by the little red line at the bottom right below the score. Building on things learned from creating mazes 14 and 15, multiple goals have been added to this maze. The learning curve for these maze games is different between keyboards and touch screens. For touch screens, if you figure out the tap, slide and hold technique, then moving the mouse is easy. If you just keep swiping, it is more difficult. 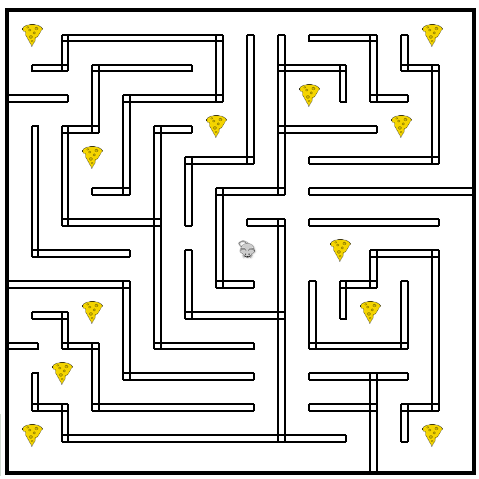 Because of the difference, the time limit is a little high for this maze which makes the game easy. More challenging games are to come.